Its been for sale on and off for about 18 months. I think he wanted $14,500, he dropped it significantly but is it worth it? That is pretty cool. I think that is worth $10,000. I have never seen one optioned like that in my travels. Wow, I love this car! I would love it even more if they restored it to it's original Silver paint WITHOUT the black vinyl top, and shod it in it's original Turbine wheels with RWL tires! But he'll likely be a while getting it. There just ain't enough nut jobs like us around with that kind of $$. I've seen 1 like that on ebay. That might even be it. It took 3 auctions to sell it, and I think it went around 9k. I think some people put more of a price tag on "rare" than quality. I'm not sure how rare this car is but I wouldn't want to buy it without the rear bumper fillers. If I'm spending that much cash (I would probably buy it at $6-7k depending on how solid the body is) I want it complete. Hawk03 wrote: I think some people put more of a price tag on "rare" than quality. I'm not sure how rare this car is but I wouldn't want to buy it without the rear bumper fillers. If I'm spending that much cash (I would probably buy it at $6-7k depending on how solid the body is) I want it complete. If I was him I would get a rear bumper filler on the car. The car looks real nice then you see a big space looking even bigger. Not a huge problem for any of the guys on this forum but not so much for the unknowing gearhead, it would decrease the sell-ability and cause some lowball-ish offers. The cars only about 20 mi. from me, I might go look at it but I'm not looking to buy and his previous ads said no tire kickers.... unless anyone here is interested? The rear bumper filler was the first thing I noticed. I bought a plastic filler for my '74 some years ago. That car is a really nice one though. When I found my El Camino it was higher than I wanted to spend, but it was exactly what I wanted to get my high school car back. I looked at a lot of them through the years and every time I tried to figure out how I could turn it to two tone blue. Looking back now it would have cost me a lot more to rebuild one than paying up for this one. Even after turning it blue, probably would still have a 100,000+ mile vehicle. By buying this one I got the right color and only 30k original miles. When I first found it my wife asked what I thought he would want for the car. I gave her my guess and when I found out his price was lower than my original estimate(still more than I was going to spent) she insisted that I buy it. It's pretty rare in that configuration and year. Very few 454s in 74 and even fewer 4 speeds. Even less in non Laguna cars. I don't care, and neither do you. Years ago, there was a discussion about an ebay auction for one similar (this one??) on Team Chevelle. It was clear that the only reason most of them had any interest in it is because they thought it would be worth more than other G3s. All they talked about was factory originality and speculation on how few were built. Sadly, to many fake car guys $$$=cool. BTW the attitude about G3s on that site has gotten better in recent years. I believe once these cars hit their stride it will be the laguna's and all the oddball combination cars that will be the most desireable. You have to ask yourself is it worth it to you or not. Anybody know what the "T93 special tail lamps" on the option sheet is all about. Was there more than one tail light style in 74? Everything automotive is rare now-adays. Quite a few 454/4spd cars were made in 74. How many got the M-21 vs the M-20? who knows, who cares. Depending on the other options it could be a one-of one. Can't be too awful rare. 2 members on here have a 74 454/4spd. I scrapped one years ago that was too far gone to save. I would say the price is right. price.... $8000 non negotiable! I talked to the guy and he said the bench seat, motor, trans and air made it ultra rare.... He took it home on a trailer. Nobody knows how many Chevelles were 454 4 spds in 74, except for those built in Canada. GM only kept numbers for model and V8 or 6. It looks like there were roughly 175000 V8 coupes produced and around 35k of those were base model Malibu. GM Heritage center says that the 4 speed (M-21) was only available with the 454. The numbers I've seen are that less than 1000 74 Chevelles came with a 4 speed and that includes El Camino and Laguna. Based on that and that 43 years have passed, I'd feel comfortable saying there ain't many of those around. Hell, In the last 10 years I've seen exactly 2 74s around here. For sale very rare 1 of 18 made in Canada...454 big block 4 speed...nice car well kept..
"This listing has been flagged for removal"
I guess it is still at $10k. I'm wondering if it was flagged that there isn't something fake about the add or fishy? I see it is listed in Milwaukee now for $10.000 but the add is slightly different it brags about it having factiory air and it states you could only get dealer installed air on the Lagunas?? lol. it also mentions we have many nos parts available, fishy is right. I like the one picture with the options listed. 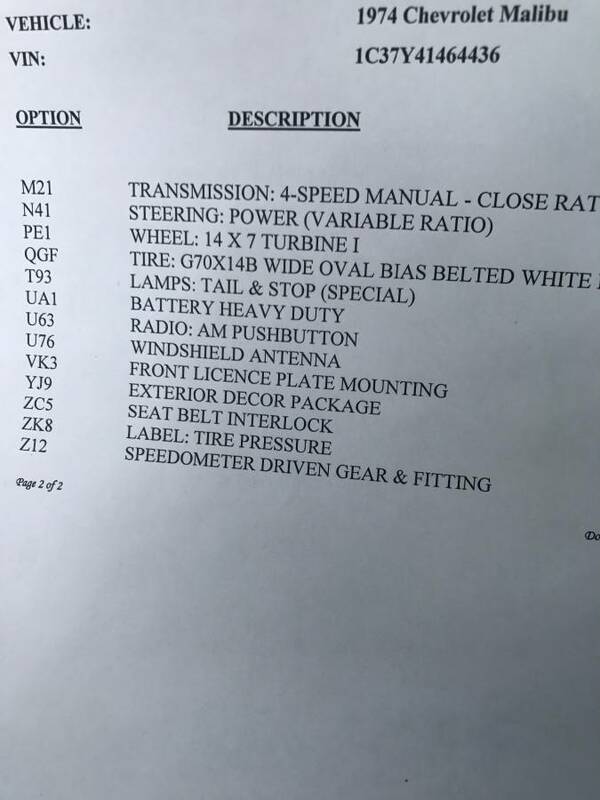 It's a legit document from Vintage vehicle services. they are in canada and provide doc's for canadian built cars. I got a doc from them for mine and it lists the last 2 on the sheet as well. It has something to do with being exported to the US. I do wonder why the seller says dealer air when the first sheet shows it as factory installed. Anyone know what the "special tail lamps" is all about? » How much is a Nugget Worth?